The Saturnalia tree is up, there’s a pagan holly and ivy wreath on the door and the kids are playing with their winter solstice presents. That can only mean one thing: it’s Zeusmas! Thank the FSM Hanukkah was early this year because it’s going to be a nightmare next year when it clashes with Kwanzaa on the 26th. And this, my friends, is why people in secular countries all over the world say happy holidays. 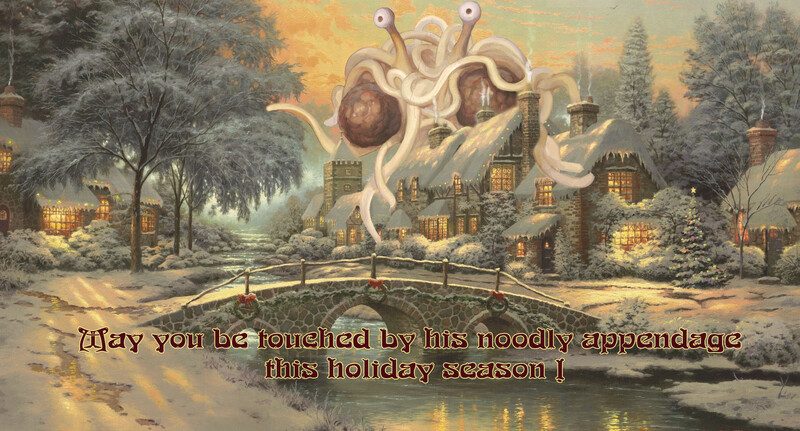 They’re not taking the Christ out of Christmas, they’re putting the Yule back into Yuletide, the Saturn back into Saturnalia, winter back into the solstice, the hog into Hogswatch and the FSM into ChriFSMas. There’s no war on Christmas, just an appreciation of the fact that most people don’t believe in the religion that claims the exclusive rights to the month of December to celebrate the birth of one of its prophets (who was actually born in spring but had the date moved to help Christianise the Roman Empire) and their insistence that the winter solstice be dedicated to their chosen religion. Now I’ve got that off my chest, I hope you have a happy whatever festival you choose to celebrate and in honour of the pagan roots of the holidays get drunk, have fun and be as debauched as your significant other/chance festive acquaintance allows you. Having a good time and making your loved ones happy is more important than arguing about whose sky fairy has the biggest tonker, especially when we all know the Flying Spaghetti Monster’s noodly appendages are way bigger than Jehovah’s old fella and He’s got hundreds of them!